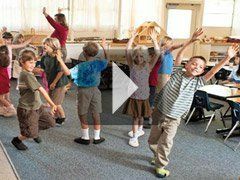 The John Morse Waldorf Methods School, in Sacramento, California, provides a different vision of education, complete with art, music, and movement. Editor's Note: In the fall of 2010, John Morse Waldorf-Inspired K-8 School moved to a new building and changed its name to Alice Birney Waldorf-Inspired K-8 School. Principal Cheryl Eining has also retired. Barbara Warren always thought she was meant to be a teacher, but after a decade working in a low-income elementary school in Sacramento, California, she was just about ready to quit. Right around the same time, however, the school district decided to convert the school to a Waldorf magnet program. So, instead of giving up, she began a three-year teacher-training program at the nearby Rudolf Steiner College. "It was a lifesaver for me," says Warren. "I found the missing element. I didn't just have to teach curriculum anymore; I got to teach children." Though the district's initial conversion plans met with resistance from some parents and teachers at the school, Warren continued on the Waldorf path and completed her courses. During the training, she and eight other teachers from her original school branched off to found the John Morse Waldorf Methods School, which opened in a residential neighborhood of Sacramento in 1997. This K-8 school, one of the first public schools inspired by Waldorf methods, infuses music, art, and movement into lessons and offers student-directed learning and what public schools refer to as looping, a process in which a teacher follows her class, ideally, from first grade through eighth grade. More than 12 years later, despite budget cuts and possible public school closures in its district, John Morse is flourishing. The program, which district administrators praise as one worth replicating, is engaged in a growth plan supported by local parents, many of whom are looking for an alternative to traditional public education. The Waldorf approach to education began in 1919 in Germany, when the owner of the Waldorf-Astoria cigarette factory asked esoteric philosopher Rudolf Steiner to start a school for the workers' children. Today, there are a thousand Waldorf schools in 91 countries, including 159 in the United States, where Waldorf's growth has been particularly vigorous. Traditional Waldorf schools are private, but the number of public schools inspired by Steiner's methods is growing, fueled in part by the passage of the No Child Left Behind Act and the charter school movement. In the United States, there are about 44 Waldorf-inspired public schools, most of them K-8 charter schools located in the West. NCLB requirements mandate that students test at grade level in reading and math, which can result in schools reducing the amount of class time dedicated to art. But Waldorf methods, in sharp contrast to traditional public education, encourage a learning pace dictated by the students themselves and an integration of the arts into lessons. Despite growing interest and support for public schools based on Waldorf approaches, the movement has its detractors. A spiritual dimension to the Waldorf philosophy has sparked debate -- and inspired at least one lawsuit -- alleging the potential inclusion of religion in the schools. The philosophy derives from Steiner's idea called anthroposophy, which includes the concept of an unseen world complete with angels hovering above daily life (and the classroom), as well as a commitment to developing the inner self in order to serve the community. Waldorf-inspired public schools, however, don't teach the students anthroposophy, nor do they incorporate spiritual practice into the curriculum. Yet, even parents familiar with the controversy are drawn to the schools' unique approach to teaching and learning. The John Morse school, which was named in an ongoing lawsuit against the district alleging that religion was taught in the classroom, still boasts wait lists for every grade level. And as Waldorf methods have become more accessible and better understood, more teachers have joined charter schools specifically inspired by Waldorf methods or have adopted some of its approaches for their own classrooms within traditional public schools. "Waldorf education is becoming contagious," says Betty Staley, a veteran Waldorf educator who has trained public school teachers at Rudolf Steiner College. "A lot of people feel there's got to be another way in education." John Morse teacher Barbara Warren, who taught first grade last year, starts each school day with the same routine: She shakes each student's hand and makes eye contact with every child before he or she enters class. On a recent spring morning, she asked a few kids about missing teeth, then spent some time calming a nervous student. "All right," Warren says to the students once they have settled down. "Are we ready, my sweet ones?" The typical Waldorf class begins with a main lesson that lasts up to two hours and is the most academic part of the day. In her first-grade classroom, Warren alternates between teaching about letters one month and numbers the next, an approach designed to build the students' long-term memory. Many Ways to Learn: A first grader draws a bee as part of a math lesson on the number six. Every number and letter the students study has an associated poem, song, and movement. 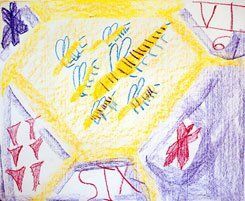 For example, as they learn about the number six, the first graders form a circle in the back of the class, and Warren draws a honeycomb (a six-sided hexagon) on the floor with chalk. She tells a story about a busy bee. The students then take turns walking around the chalk shape while the rest of the class shouts out multiples of six, all the way up to 72. In the hallway, the same students talk about a beehive they have on campus. At seven years old, they're thoroughly interested in bees, and that interest fuels their lessons in math. The idea, according to the Waldorf method, is to reach children on their developmental levels while inspiring their imagination, rather than just facilitate rote memorization of multiplication tables. There are no textbooks in this classroom. Instead, when the students are at their desks, they use lesson books they create and illustrate for each subject. In their math books, they've drawn images of bees with six legs. Later, they sit up at their desks and wave their hands to tell Warren they know the numbers that add up to 20. Two hours into their math lesson, they are still focused and energetically on task. Waldorf education divides childhood into three seven-year stages of development: The first stage, birth to seven years old, is imitation, when children are encouraged to learn through play and movement. The second stage of development, seven to 14 years, is imagination, when students learn through images, art, and stories. At this stage, when the students' emotions are thought to be developing, Waldorf practitioners believe that the stable relationship with one teacher is key. The third stage, from 14 to 21, is inspired thinking, when students become engaged intellectually and are encouraged to analyze information and think critically. The Waldorf method suggests that teachers time their teaching to coincide with a child's readiness to learn. For instance, they teach writing before reading, which sometimes results in students starting to read as late as the third grade. "We hold back on intellectualizing the child until it's time," says sixth-grade teacher Chris Whetstone. In "Learning from Rudolf Steiner: The Relevance of Waldorf Education for Urban Public School Reform," a study published in 2008 in the journal Encounter: Education for Meaning and Social Justice, researcher Ida Oberman concluded that the Waldorf approach successfully laid the groundwork for future academics by first engaging students through integrated arts lessons and strong relationships instead of preparing them for standardized tests. In her assessment of four California public schools that use Waldorf methods, Oberman found that students tested below peers in language arts and math in the second grade, but they matched or tested above their peers in the same subjects by eighth grade. Observers note that second-grade students gain a love of learning through kid-friendly classroom activities that pay off academically in later grades. Oberman says John Morse has also successfully followed California state standards and trained and retained teachers at an impressive level. Along with integration of the arts and sensitivity to each student's development, relationships are considered crucial to success in Waldorf education philosophy. Teachers rely heavily on the bond that evolves between them and their students as they move together from the first grade until the students graduate from eighth grade. During this time, students and their families have to work through conflicts with the assigned teacher, and even though such problems inevitably arise, it's uncommon for students to switch to another teacher. At John Morse, Chris Whetstone has been with his current class for six years. He says that they have become like a family, making it possible for him to intervene early when interpersonal conflicts between students begin to brew. It also gives him an advantage as he works to develop each child's individual character. Parents describe it as a gift to have another adult who gets to know their children over many years and who becomes deeply involved in their development. "Mr. Whetstone was the best teacher ever," says 22-year-old John Morse graduate Layal Maalouf. "I loved John Morse. Those still count as some of the best years of my life. I built a lasting foundation there." With a Rudolf Steiner teacher-training college in the area and many community parents familiar with Waldorf elementary schools, the new high school received early and enthusiastic support. Still, supporters and participants in the school consider Carver an experiment because adapting Waldorf methods to a public high school is uncharted territory for them. In a near mirror image of the John Morse morning routine, teachers at Carver meet their students at the door each day, shake their hands, and look them in the eye. Teachers integrate the arts into the curriculum, and students create their own lesson books for each subject. Using the classic Waldorf developmental approach, students study drama in the ninth grade to reflect where they are emotionally. Other methods used by Waldorf schools, such as looping and a daily centerpiece lesson, are not as practical in high school, so the teachers are interpreting these tactics even more broadly. George Washington Carver principal Allegra Alessandri, who worked for private Waldorf schools for 20 years, says they're adapting looping so that each student will have the same homeroom teacher for four years to create a lasting bond with that individual. In fall 2009, ninth- and tenth-grade students will start a two-year Waldorf core class that integrates subjects such as art history, poetry, art, drama, and gardening. "What we're doing by taking Waldorf to the public sector is developing a reform movement," says Alessandri, who was a founder of the new high school. "We're changing the way the district looks at teaching and the way it looks at success." Go to "Waldorf Methods You Can Use in Your Classroom" and "Waldorf-Inspired Curriculum Materials." The Association of Waldorf Schools of North America owns the registered service mark of Waldorf for educational services. The AWSNA maintains that its service mark should be used only in the name of schools, institutions, or organizations that have received express permission from AWSNA to represent themselves with Waldorf in their names or subtitles. Guidelines for affiliation with the AWSNA are available from the association.